Nagaland belongs to the Northeastern part of India, this state is covered by mountains which gives a unique beauty to this land. Nagaland is a land of culture and cuisine, the various tribes in this state have their unique dishes and the cuisine differes from the other tribes. A typical Naga meal have rice with a meat dish, a couple of boiled vegetable and definitely a chutney.The important characteristic of this cuisine is the dishes are cooked by boiling the ingredients and they avoid mostly frying. The Nagas are Non vegetarian lovers, obviously their cuisine have unique taste as they cook their foods with local ingredients which are sometime hard to find out of this state. Pork meat is very popular in this cuisine, this meat cooked with bamboo shoots is the popular dish of this cuisine. Chillies and ginger are the most important ingredients used in this cuisine and obviously local herbs and leaves are used as well.Fermenting food is famous in the cuisine of Nagaland just to preserve their food, the food items are first boiled and then dried under the sun or near the fire. Then later wrapped in banana leaf and stored for future use. Tribes of Naga eat many animals and insects, yes they eat dog meat and wild animals they are considered as delicacy in Nagaland.Many unique believes and methods of preparing and having food have made the cuisine of Nagaland one of most unique cuisines of India which has till now retained and remained largely unaffected by the modernization of the food culture in the country.Obviously we had hard time to get a vegetarian dish from this cuisine, finally i ended my search of chosing a vegetarian dishes from this state stopped with this Dal Egg curry. Dunno whether these dishes are eaten there since we dont have any source of Nagaland dishes we started sticking to the recipe sources we got through the web.Coming to this dal egg curry, we enjoyed thoroughly with rice and pickles, a different dal curry and we loved it. Boil the three dals together with enough salt and turmeric owder, keep aside. Heat enough oil, fry the onion paste and tomato puree. Add the eggs, fry until the onion paste turns brown. Add half a cup of water, cover the pan cook for few minutes. Now add the cooked dal to this mixture, stir well. Cook for few minutes,put off the stove. I think this sounds wonderful. I love these flavors. Good choice..nice clicks priya..I am sure you can make this regularly now. super yummy egg curry with lots of dal. WOW..ENTIRELY NEW KIND OF CURRY..NEVER HAD IT BEFORE..LOOKS DELISH AND U R VERY CREATIVE WITH ALL THE RECIPES IN UR BLOG. KEEP ROCKING PRIYA.. Varied one..With the goodness of immense protein...An eye opener in many respects.Thanks Priya. The combination of the daals is interesting. .we don't eat eggs but these surely can be substituted. Good one Priya, dal with egg combination is new to me, neatly done! Lovely gravy. 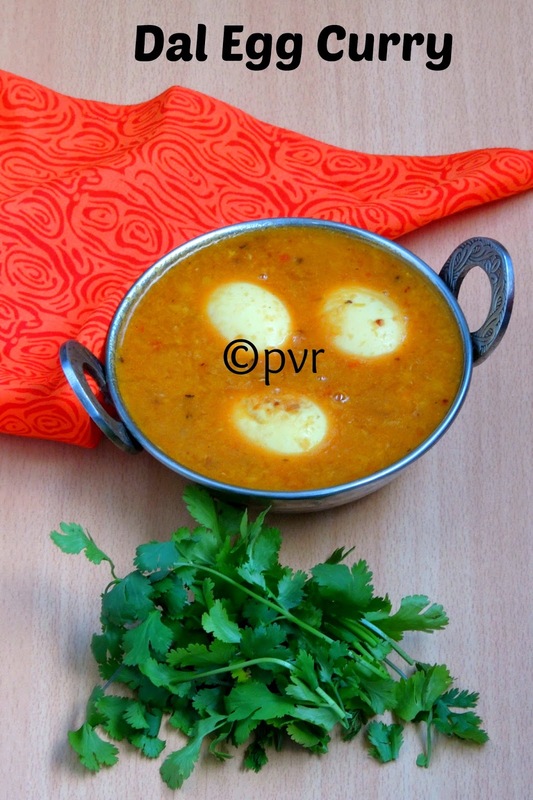 I must this try this variation of egg curry. Love the curry gravy! This must be very tasty. That is such a protein rich dish. Love the dal gravy with eggs. Egg and dhal combo sounds simply superb,must be a delicious one,perfect with steamed rice..
Eggs in dal is quite unique. You found a nice recipe. Fabulous recipe choice , yes its tough time for us to find NE foods .. I am totally loving the way you have made all wonderful recipes for each state aks :) hats off on th efforts !! This is awesome. Delicious. NE sates were so very tough.